You brush your teeth twice a day and visit the dentist at least once a year - but does your pet have the same sort of dental care regimen? Clean teeth and a healthy mouth are extremely important for your pet. Plaque and tartar build-up on your pet's teeth can lead to serious health problems and this makes dental care a must for your pet. The Yancey Clinic of Veterinary Medicine is pleased to offer our clients and their pets a complete array of veterinary dental care services. 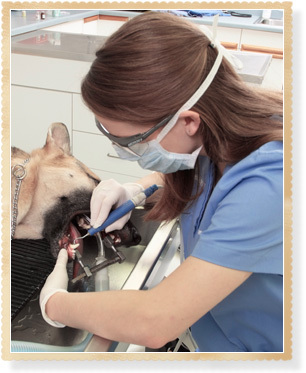 We provide comprehensive dental cleanings, tooth extractions and other pet dental procedures. Veterinary dental cleanings are very different for pets than they are for you. Because anesthesia is required to keep your pet still and comfortable during a cleaning, your pet undergoes a complete physical examination prior to the cleaning, in order to detect any complications that may occur from the use of anesthesia. During a cleaning, the skilled veterinary technicians at The Yancey Clinic of Veterinary Medicine use a hand scaler to remove tartar and plaque from your pet's teeth. Next, a periodontal probe is used to check under the gumline for signs of periodontal disease. An ultrasonic scaler is used to clean the teeth above the gumline, and a curette is used to clean and smooth the teeth below the gumline. Finally, your pet's teeth are polished and his or her gums are washed with an anti-bacterial solution to prevent future tartar build-up. Keeping your pet's teeth clean is a year-round process. Our staff members can show you how to brush your pet's teeth at home. This helps delay the build-up of plaque and tartar and is a great way for you to bond with your pet.